Our U17 Soccer team played the FAI Schools Munster Semi-final in Clonmel on Tuesday 22nd January against High School. Clonmel. This keenly fought semi-final was played in great spirit by two teams giving their all for a place in the Munster Final. C.S.N. took the lead in the first half but High School equalised from a free-kick. It remained 1-1 at half time. There was little between two well-matched teams in the second half with both defences holding out. The real drama happened in extra time! High School took the lead with a looping header and when it seemed that the game was gone from C.S.N., Wymin Sivakumar scored a stunning equaliser with virtually the last kick of an enthralling match. The penalty shoot out was even more dramatic and tense with both teams matching each other at 5-5. It was down to a sudden death shoot out which went to the 8th penalty. Michael Quirke scored number 8 for C.S.N. and when a High School player hit their last kick there was an explosion of joy and relief from the C.S.N. squad. The “Never Say Die” spirit of this group of players was evident again. Team: K Delaney, Cian Connolly (Capt. ), I. Quirke, K. Donovan, F. Stevens, W. Sivakumar, K. O’Sullivan, C. Quirke, C. Connolly, M. Quirke, D. O’Regan. Subs who played : A. Buckley, L. Hogan & A. McElligott. Congratulations to all of their team and their coaches Mr. K. O’Mahony, Mr. G. Burke & Mr. D. Davis..
We wish them the very best of luck in the Munster Final which is due to take place in February. Our five new first-year classes have found their lunchtimes very busy since the beginning of September as they have been taking part in our annual First Year Hurling and Football Leagues. This year we played off our games on Mondays, Tuesdays, Thursdays and Fridays and the fine weather ensured that they were run off smoothly and, much more importantly, that our new arrivals had the optimum chance to show off their skills. The hectic schedule saw us play eight games per-week, so many teachers were required to referee and their smartness with the whistle made sure that all of the games were free-flowing spectacles. Also, our fourth years, who cut their managerial teeth with aplomb, did an excellent job in managing their respective teams’ talents and enthusiasm. As ever, these leagues could not happen without this help, so we’re incredibly grateful to all who gave up their free-time. Football seems to be a more popular game with this years’ First Years as each class saw a spike in numbers for the football league. Naomh Proinsias found themselves amongst the pace-setters and it was Naomh Micheál who joined them in winning all of their games as both teams made it through to the decider. Period six on Wednesday saw all first years receive the opportunity to cheer on their schoolmates in glorious sunshine and, truth be told, there was little talk of anything else all day. Naomh Proinsias, buoyed on by the disappointment of the hurling final, were well on top throughout and plundered four goals on their way to an insurmountable total of 4-3. 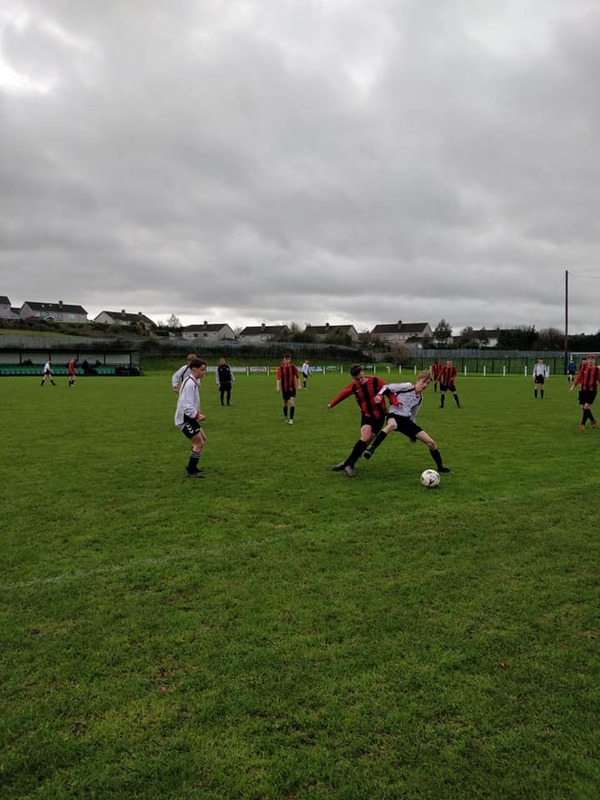 Jack Twomey, Seán Lombard and Kevin Werner were the goalscorers and they were led to glory by their captain from St. Finbarrs, Jordan Millard. Well done to all of the class teams for taking part and making it a very memorable league. On Friday 28th September our annual Mara Sports Day took place and it was a huge success. The weather was perfect and everyone had a really enjoyable day. Students took part in soccer, chess, uni-hoc, tag rugby, basketball & table tennis. Some of our 4th & 5th Year students were on duty as D.J.’s and kept the music blaring!! There was a cold start to the day but the hardy 6th Years battled the elements and didn’t let the cold deter them! Ms. O’Connor took to the pitch for her debut as a soccer ref and she was outstanding! Well done to all of our staff and students! The hurling competition got us under way and it was clear very early in the competition that there were two classes with a bit more ‘snas’ to their play as they won all of their matches. In the end we saw the teams of Naomh Proinsias and Naomh Eoin battle it out in an exciting final at the end of September. The teams were level up to the final few minutes of the game when N. Eoin scored 3 goals. In the end, it was the young Turks of Naomh Eoin who emerged as champions, led by their strong captain from Ballinhassig, Adam O’Sullivan. The final score was N. Eoin 5-02, N. Proinsias 2-02. Congratulations to our 4th year student Wymin Sivakumar!! He represented C.S.N. at the All Ireland Schools Track and Field Championships in Tullamore on 2nd June. Wymin won the Intermediate Boys’ Triple Jump with a best of 13.51m and then won silver in the 100m hurdles with a time of 13.64. Congratulations again Wymin from all in C.S.N. For the past 40 years Mr Declan Davis has organised and run the First Year Soccer Championship in C.S.N. Our First Year classes pick their teams and the play offs are held at lunchtimes. The matches are much anticipated and there is always a crowd to cheer them on. This year the final took place on Thursday 17th May between teams from N. Breandán and N. Fionnbarra. The eventual winners were N. Fionnbarra with a score of 4-1. Sincere thanks to Mr Davis for his fantastic and ongoing contribution to soccer in C.S.N. And as the students say “He’s a legend” & “An icon”. N. Fionnbarra: G. Harrington, B. Maher, J. Sienicki, C. Donovan, M. O’Connor, S. Kelleher, G. Igbinoghene, C. Hourigan, J. Twomey, M. O’Brien, D. O’Connell, N. Garvey. N. Breandán: D. O’Sullivan, D Cooper- Power, B. DOnnelly, A. Ziurnia, S. Walsh, D. O’Regan, B. Mee, B. Donnelly, E. Desmond, K. Daly, F. Haque, M Lashkul, A, Phelan. Congratulations to our Senior Football team! They won the Lord Mayors Cup (A) against Coláiste Choilm, Ballincollig with a score of 2- 07 to 0-10. The match was played in Páirc Uí Chaoimh on Monday 14th May. Captain Matthew Brady accepted the trophy from the Lord Mayor after a keenly contested match. Well done to the team and their coaches Mr. Seymour & Mr Donovan from all in C.S.N. Congratulations to our U16.5 Football Team! They were crowned Munster Champions in the Corn Liam Uí Uigínn Munster Final in Killarney on Tuesday 8th May. C.S.N. were leading at half-time with a score of 3-5 to 0-4 against Coláiste an Sceilige. Coláiste na Sceilige fought back in the second half but C.S.N. kept up the pace and the match finished on a scoreline of 5-14 to 1-10. Well done to the team and their coaches Mr. A. Seymour & Mr. K. Canty from all in C.S.N. Many thanks to Jack Kelleher (2nd Year ) for the fantastic photographs. Congratulations to our Senior Hurling Team! They won the Lord Mayors’ Cup in the Mardyke Arena on Tuesday 1st May . Conditions were terrible but C.S.N. played a great match against Hamilton High School Bandon. The final score was 0-12 to 0-10. Congratulations to the team and their coaches Mr Greene, Mr Walsh & Mr Canty.